Undoing poverty’s negative effect on brain development with cash transfers – Cameron McLeod. An upcoming experiment into brain development and poverty by Kimberly G Noble, associate professor of neuroscience and education at Columbia University’s Teachers College, asks whether poverty may affect the development, “the size, shape, and functioning,” of a child’s brain, and whether “a cash stipend to parents” would prevent this kind of damage. Noble writes that “poverty places the young child’s brain at much greater risk of not going through the paces of normal development.” Children raised in poverty perform less well in school, are less likely to graduate from high school, and are less likely to continue on to college. Children raised in poverty are also more likely to be underemployed when adults. Sociological research and research done in the area of neuroscience has shown that a childhood spent in poverty can result in “significant differences in the size, shape and functioning” of the brain. Can the damage done to children’s brains be negated by the intervention of a subsidy for brain health? Children who live in poverty tend to perform worse than peers in school on a bevy of different tests. They are less likely to graduate from high school and then continue on to college and are more apt to be underemployed once they enter the workforce. Research that crosses neuroscience with sociology has begun to show that educational and occupational disadvantages that result from growing up poor can lead to significant differences in the size, shape and functioning of children’s brains. Poverty’s potential to hijack normal brain development has led to plans for studying whether a simple intervention might reverse these injurious effects. A study now in the planning stages will explore if a modest subsidy can enhance brain health. The goal of Dr. Noble’s research is to better characterize socioeconomic disparities in children’s cognitive and brain development. Ongoing studies in her lab address the timing of neurocognitive disparities in infancy and early childhood, as well as the particular exposures and experiences that account for these disparities, including access to material resources, richness of language exposure, parenting style and exposure to stress. Finally, she is interested in applying this work to the design of interventions that aim to target gaps in school readiness, including early literacy, math, and self-regulation skills. She is honored to be part of a national team of social scientists and neuroscientists planning the first clinical trial of poverty reduction, which aims to estimate the causal impact of income supplementation on children’s cognitive, emotional and brain development in the first three years of life. 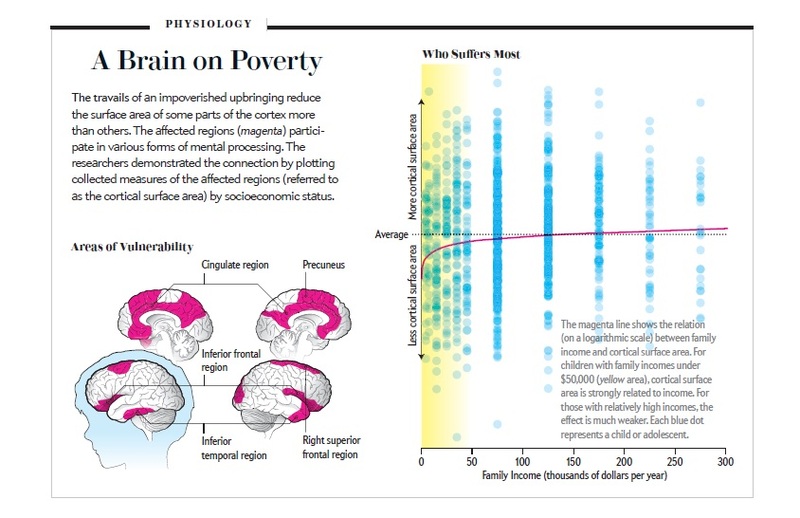 In the latest issue of the Scientific American, Kimberly Noble, associate professor in neuroscience and education, reviews her work and introduces an ambitious research project that may help understand the cause-and-effect connection between poverty and children’s brain development. For the past 15 years, Noble and her colleagues have gathered evidence to explain how socioeconomic disparities may underlie differences in children’s cognition and brain development. In the course of their research they have found for example that children living in poverty tend to have reduced cognitive skills – including language, memory skills and cognitive control (Figure 1). More recently, they published evidence showing that the socio-economic status of parents (as assessed using parental education, income and occupation) can also predict children’s brain structure. By measuring the cortical surface area of children’s brains (ie the area of the surface of the cortex, the outer layer of the brain which contains all the neurons), they found that lower family income was linked to smaller cortical surface area, especially in brain regions involved in language and cognitive control abilities (Figure 2 – in magenta). In the same research, they also found that longer parental education was linked to increased hippocampus volume in children, a brain structure essential for memory processes. Overall, Noble’s work adds to a growing body of research showing the negative relation between poverty and brain development and these findings may explain (at least in part) why children from poor families are less likely to obtain good grades at school, graduate from high-school or attend college. What is less known however, is the causal mechanism underlying this relationship. As Noble describes, differences in school and neighbourhood quality, chronic stress in the family home, less nurturing parenting styles or a combination of all these factors might explain the impact of poverty on brain development and cognition. To better understand the causal effect of poverty, Noble has teamed up with economists and developmental psychologists and together, they will soon launch a large-scale experiment or “randomised control trial”. As part of this experiment, 1000 US women from low-income backgrounds will be recruited soon after giving birth and will be followed over a three-year period. Half of the women will receive $333 per month (if they are part of the “experimental” group) and the other half will receive $20 per month (if they are part of the “control” group). Mothers and children will be monitored throughout the study, and mothers will be able to spend the money as they wish, without any constrains. By comparing children belonging to the experimental group to those in the control group, researchers will be able to observe how increases in family income may directly benefit cognition and brain development. They will also be able to test whether the way mothers use the extra income is a relevant factor to explain these benefits. Noble concludes that “although income may not be the only factor that determines a child’s developmental trajectory, it may be the easiest one to alter” through social policy. And given that 25% of American children and 12% of British children are affected by poverty (as reported by UNICEF in 2012), policies designed to alleviate poverty may have the capacity to reach and improve the life chances of millions of children. NGN is looking forward to see the results of this large-scale experiment. We expect that this project, in association with other research studies, will improve our understanding of the link between poverty and child development, and will help design better interventions to support disadvantaged children. Socioeconomic inequality and children’s brain development. Research addresses issues at the intersection of psychology, neuroscience and public policy. Kimberly Noble, MD, PhD, is an associate professor of neuroscience and education at Teachers College, Columbia University. She received her undergraduate, graduate and medical degrees at the University of Pennsylvania. As a neuroscientist and board-certified pediatrician, she studies how inequality relates to children’s cognitive and brain development. Noble’s work has been supported by several federal and foundation grants, and she was named a “Rising Star” by the Association for Psychological Science. Together with a team of social scientists and neuroscientists from around the United States, she is planning the first clinical trial of poverty reduction to assess the causal impact of income on cognitive and brain development in early childhood. What can neuroscience tell us about why disadvantaged children are at risk for low achievement and poor mental health? How early in infancy does socioeconomic disadvantage leave an imprint on the developing brain, and what factors explain these links? How can we best apply this work to inform interventions? These and other questions are the focus of the research my colleagues and I have been addressing for the last several years. What is socioeconomic status and why is it of interest to neuroscientists? The developing human brain is remarkably malleable to experience. Of course, a child’s experience varies tremendously based on his or her family’s circumstances (McLoyd, 1998). And so, as neuroscientists, we can use family circumstance as a lens through which to better understand how experience relates to brain development. Family socioeconomic status, or SES, is typically considered to include parental educational attainment, occupational prestige and income (McLoyd, 1998); subjective social status, or where one sees oneself on the social hierarchy, may also be taken into account (Adler, Epel, Castellazzo & Ickovics, 2000). A large literature has established that disparities in income and human capital are associated with substantial differences in children’s learning and school performance. For example, socioeconomic differences are observed across a range of important cognitive and achievement measures for children and adolescents, including IQ, literacy, achievement test scores and high school graduation rates (Brooks-Gunn & Duncan, 1997). These differences in achievement in turn result in dramatic differences in adult economic well-being and labor market success. However, although outcomes such as school success are clearly critical for understanding disparities in development and cognition, they tell us little about the underlying neural mechanisms that lead to these differences. Distinct brain circuits support discrete cognitive skills, and differentiating between underlying neural substrates may point to different causal pathways and approaches for intervention (Farah et al., 2006; Hackman & Farah, 2009; Noble, McCandliss, & Farah, 2007; Raizada & Kishiyama, 2010). Studies that have used a neurocognitive framework to investigate disparities have documented that children and adolescents from socioeconomically disadvantaged backgrounds tend to perform worse than their more advantaged peers on several domains, most notably in language, memory, self-regulation and socio-emotional processing (Hackman & Farah, 2009; Hackman, Farah, & Meaney, 2010; Noble et al., 2007; Noble, Norman, & Farah, 2005; Raizada & Kishiyama, 2010). More recently, we and other neuroscientists have extended this line of research to examine how family socioeconomic circumstances relate to differences in the structure of the brain itself. For example, in the largest study of its kind to date, we analyzed the brain structure of 1099 children and adolescents recruited from socioeconomically diverse homes from ten sites across the United States (Noble, Houston et al., 2015). We were specifically interested in the structure of the cerebral cortex, or the outer layer of brain cells that does most of the cognitive “heavy lifting.” We found that both parental educational attainment and family income accounted for differences in the surface area, or size of the “nooks and crannies” of the cerebral cortex. These associations were found across much of the brain, but were particularly pronounced in areas that support language and self-regulation — two of the very skills that have been repeatedly documented to show large differences along socioeconomic lines. Several points about these findings are worth noting. First, genetic ancestry, or the proportion of ancestral descent for each of six major continental populations, was held constant in the analyses. Thus, although race and SES tend to be confounded in the U.S., we can say that the socioeconomic disparities in brain structure that we observed were independent of genetically-defined race. Second, we observed dramatic individual differences, or variation from person to person. That is, there were many children and adolescents from disadvantaged homes who had larger cortical surface areas, and many children from more advantaged homes who had smaller surface areas. This means that our research team could in no way accurately predict a child’s brain size simply by knowing his or her family income alone. Finally, the relationship between family income and surface area was nonlinear, such that the steepest gradient was seen at the lowest end of the income spectrum. That is, dollar for dollar, differences in family income were associated with proportionately greater differences in brain structure among the most disadvantaged families. More recently, we also examined the thickness of the cerebral cortex in the same sample (Piccolo, et al., 2016). In general, as we get older, our cortices tend to get thinner. Specifically, cortical thickness decreases rapidly in childhood and early adolescence, followed by a more gradual thinning, and ultimately plateauing in early- to mid-adulthood (Raznahan et al., 2011; Schnack et al., 2014; Sowell et al., 2003). Our work suggests that family socioeconomic circumstance may moderate this trajectory. Specifically, at lower levels of family SES, we observed relatively steep age-related decreases in cortical thickness earlier in childhood, and subsequent leveling off during adolescence. In contrast, at higher levels of family SES, we observed more gradual age-related reductions in cortical thickness through at least late adolescence. We speculated that these findings may reflect an abbreviated period of cortical thinning in lower SES environments, relative to a more prolonged period of cortical thinning in higher SES environments. It is possible that socioeconomic disadvantage is a proxy for experiences that narrow the sensitive period, or time window for certain aspects of brain development that are malleable to environmental influences, thereby accelerating maturation (Tottenham, 2015). Are these socioeconomic differences in brain structure clinically meaningful? Early work would suggest so. 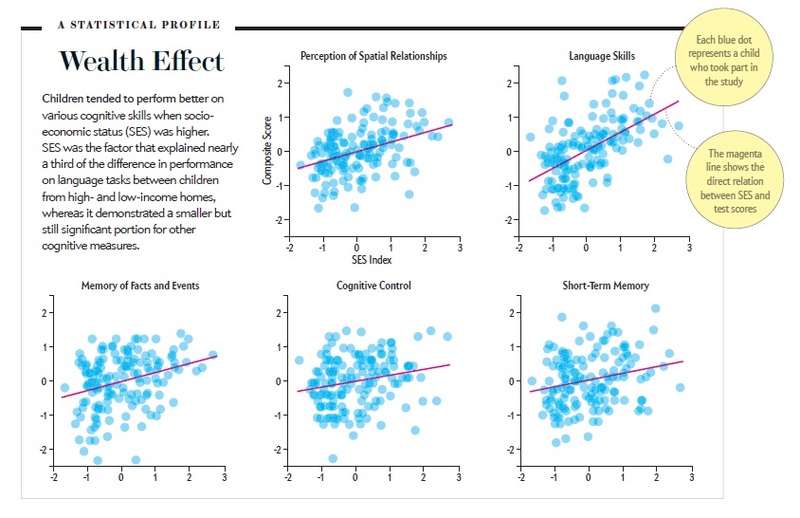 In our work, we have found that differences in cortical surface area partially accounted for links between family income and children’s executive function skills (Noble, Houston et al., 2015). Independent work in other labs has suggested that differences in brain structure may account for between 15 and 44 percent of the family income-related achievement gap in adolescence (Hair, Hanson, Wolfe & Pollak, 2015; Mackey et al., 2015). This line of research is still in its infancy, however, and several outstanding questions remain to be addressed. How early are socioeconomic disparities in brain development detectable? By the start of school, it is apparent that dramatic socioeconomic disparities in children’s cognitive functioning are already evident, and indeed, several studies have found that socioeconomic disparities in language (Fernald, Marchman & Weisleder, 2013; Noble, Engelhardt et al., 2015; Rowe & Goldin-Meadow, 2009) and memory (Noble, Engelhardt et al., 2015) are already present by the second year of life. But methodologies that assess brain function or structure may be more sensitive to differences than are tests of behavior. This raises the question of just how early we can detect socioeconomic disparities in the structure or function of children’s brains. One group reported socioeconomic differences in resting electroencephalogram (EEG) activity — which indexes electrical activity of the brain as measured at the scalp — as early as 6–9 months of age (Tomalski et al., 2013). Recent work by our group, however, found no correlation between SES and the same EEG measures within the first four days following birth (Brito, Fifer, Myers, Elliott & Noble, 2016), raising the possibility that some of these differences in brain function may emerge in part as a result of early differences in postnatal experience. Of course, a longitudinal study assessing both the prenatal and postnatal environments would be necessary to formally test this hypothesis. Furthermore, another group recently reported that, among a group of African-American, female infants imaged at 5 weeks of age, socioeconomic disadvantage was associated with smaller cortical and deep gray matter volumes (Betancourt et al., 2015). It is thus also likely that at least some socioeconomic differences in brain development are the result of socioeconomic differences in the prenatal environment (e.g., maternal diet, stress) and/or genetic differences. Disentangling links among socioeconomic disparities, modifiable experiences and brain development represents a clear priority for future research. Are the associations between SES and brain development the result of differences in experiences that can serve as the targets of intervention, such as differences in nutrition, housing and neighborhood quality, parenting style, family stress and/or education? Certainly, the preponderance of social science evidence would suggest that such differences in experience are likely to account at least in part for differences in child and adolescent development (Duncan & Magnuson, 2012). However, few studies have directly examined links among SES, experience and the brain (Luby et al., 2013). In my lab, we are actively focusing on these issues, with specific interest in how chronic stress and the home language environment may, in part, explain our findings. How can this work inform interventions? Quite a few interventions aim to reduce socioeconomic disparities in children’s achievement. Whether school-based or home-based, many are quite effective, though frequently face challenges: High-quality interventions are expensive, difficult to scale up and often suffer from “fadeout,” or the phenomenon whereby the positive effects of the intervention dwindle with time once children are no longer receiving services. What about the effects of directly supplementing family income? Rather than providing services, such “cash transfer“ interventions have the potential to empower families to make the financial decisions they deem best for themselves and their children. Experimental and quasi-experimental studies in the social sciences, both domestically and in the developing world, have suggested the promise of direct income supplementation (Duncan & Magnuson, 2012). To date, linkages between poverty and brain development have been entirely correlational in nature; the field of neuroscience is silent on the causal connections between poverty and brain development. As such, I am pleased to be part of a team of social scientists and neuroscientists who are currently planning and raising funds to launch the first-ever randomized experiment testing the causal connections between poverty reduction and brain development. The ambition of this study is large, though the premise is simple. We plan to recruit 1,000 low-income U.S. mothers at the time of their child’s birth. Mothers will be randomized to receive a large monthly income supplement or a nominal monthly income supplement. Families will be tracked longitudinally to definitively assess the causal impact of this unconditional cash transfer on cognitive and brain development in the first three years following birth, when we believe the developing brain is most malleable to experience. We hypothesize that increased family income will trigger a cascade of positive effects throughout the family system. As a result, across development, children will be better positioned to learn foundational skills. If our hypotheses are borne out, this proposed randomized trial has the potential to inform social policies that affect the lives of millions of disadvantaged families with young children. While income may not be the only or even the most important factor in determining children’s developmental trajectories, it may be the most manipulable from a policy perspective.